This is a response to Hank Pellissier’s essay on the cruelty of God. My friend Lincoln has already written a response about theism in general, but I wanted to say something about the portrayal of the Hebrew scriptures as a testament to bloodlust. I am a Christian, and a lot of my Christian friends simply dismiss the Hebrew scriptures (the “Old Testament”) out of hand. So there is no need for me to defend it, no need for me to present it as something other than the record of a primitive tribe’s violent impulses. The Hebrew scriptures are one of the most beautiful and nuanced collections of literature the world has ever produced. Yes, much of it is violent. It records the history of a violent world, and of a necessarily violent people within that world. There is no excusing that violence. There is no minimizing the horror of that violence. But to stop with that realization is to miss what these people, in the midst of dark and hopeless circumstances, did. Most of them were writing from the position of slaves, exiles, or vagabonds. Most of them were in the position of looking at power from the outside. And so, as they wrote and collected their histories and genealogies, they wove together the most thorough indictment of violence and corruption the world has ever seen. Like all great literature, these stories don’t tell, they show. They pull back the curtain and show us the truth - and they expect us to be able to come to our own conclusions. One of the most obvious examples of this is the story of Abraham and the sacrifice of Isaac. Up to this point, Abraham had seen his god as being like every other god in the world - petty, demanding, and hungry for blood. And so when Yahweh asked Abraham to sacrifice his son, Abraham knew that this was the cost of having divine protection. The scene had played itself out a thousand times. A father leads his son to the altar, raises the knife, and strikes. The body is offered to the god, and the god is pleased. But when Abraham raised his knife, God stopped him. The ancient Jews would have read this as a rejection of human sacrifice. Their God had refused to accept human flesh. Not only that, but Abraham had been stopped at the point of the kill - the point where he could see and contemplate just what he had been about to do. This was not an intellectual rejection of human sacrifice - it was a rejection that was supposed to sink deep into the psyche of every parent in Israel. But more than that, they would have understood that Isaac, their father, was the one almost killed. Every other deity championed the strong, the warriors, the ones who held the knife. Every other people claimed descent from someone who had murdered his way to the top. But the Jews claimed descent from someone who was almost the victim. This story served to generate empathy. Every time a Jew raised a knife, he could not help but see himself as potentially killing the chosen son. And every time a human was led to the slaughter, a Jew could not help but think about their own origins, and how that could have easily been them. For this reason, the Hebrew scriptures give us some of the most sober story-telling anywhere. Rather than glorify and exaggerate the qualities of their leaders, they systematically unveil their flaws, corruption, and crimes. Rather than suggesting that the victims “deserved it”, they show us that the ones being killed by Jewish heroes were actually innocent. The more we look into this, the more amazing it is. Moses, Solomon, David - all of their sordid affairs, murders, and conspiracies are clearly laid out. The more highly regarded a figure is in Jewish culture, the more the text focuses on their corruption. Rather than justifying their actions or their violence, the text lays out just how bad it really was. Rather than suggesting that these leaders were “in the right”, it shows us that they were unquestionably in the wrong. 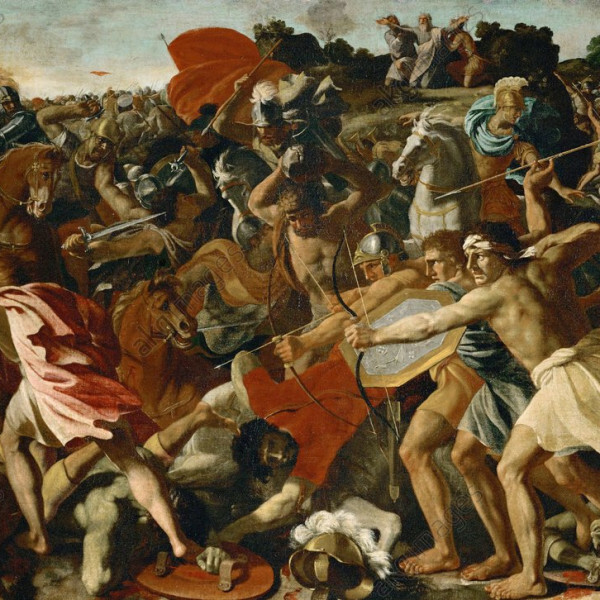 Thus the profound irony of seeing the Hebrew bible as a book of violence and bloodlust. All of these things are there because the authors are trying to capture and expose the unflinching truth of their world - a world in which everyone was involved in murder and scapegoating. They include violence not to condone it, but to reflect it back, so that the world could see its horror. I find this deeply inspiring. In the midst of immeasurable violence, they dared to think that humanity was not meant to live in violence. Instead, they gave us a mythology in which humans were made to live in peace and in ongoing creation and innovation. They asserted that the world of human sacrifice and warfare was temporary and unnatural. This is the true basis for the “unrealistically” loving God of the New Testament. It is what Jesus saw when he read the scriptures - what convinced him to completely reject violence himself. And this is why he went to the cross - not to appease an angry god, but as an attempt to overpower the imperial system of violence with his own compassion. Within a few hundreds years, both crucifixion and the system of ancient human sacrifice were completely gone. And humanity was on the way to realizing what the Hebrew scriptures had asserted: that violence was not an inescapable part of the human condition, but something to be rejected and pushed back as humanity moved forward. It is unfortunate that Christians have done so little to publicize these characteristics of the Hebrew bible. But this is not an isolated or new understanding. René Girard has done a great deal of scholarly work on it. Jesus himself made clear that this is how he read the scriptures. While the New Testament says what it means “out loud”, the Hebrew scriptures show us the truth in a way that has the power to change our mentality, to generate empathy and compassion. And this is the final irony. Many modern readers, upon confronting the Jewish text, recoil in horror at the violence they see there. The irony is that this is exactly what the original authors intended. Thanks, Micah. Any related thoughts on the prophet sending the bear after children? While I like and agree with your premise Micah, I wonder whether you are seeing this in a "high view" sort of way, which of course is easier with so many centuries having passed since the OT was written. What I'm wondering is whether the "average Israelite" back several thousand years ago did actually perceive these tales this way or if they instead concentrated on the "glorious chosen people of God " aspect and "ate up" the violence & conquest parts while glossing over the humbling mistakes and misdeeds of David, et al. The reason I ask this is because in our own time so very many "common Christians " seem to totally misunderstand why Christ came, what He taught us and how He expects us to live our lives in relationship to others. Rather than seeing Him as teaching love for all men, forgiving others, being humble, being inclusive and helping the least of these among us they see Him (and act themselves ) as proud, judgemental, exclusive and teaching you must "pull yourself up by your bootstraps" rather than helping the poor, sick and weak. Since the NT spells out the Truth very clearly yet so many "believers" don't seem to have clue, I question whether the "average" Israelite was able to "get it right" back then. Remember, even their religious leaders "didn't get it right" and couldn't see how far they had wandered from the "spirit of the Law", much less correctly understood the Prophets. Which is why they rejected Christ. What do you think ? This isn't a part of the text I've thought that much about, so I don't have any real insights here. It is a remarkable story, though. I'll just point out what stands out to me. Elijah is about to ascend to heaven. He knows it is going to happen, so he keeps trying to ditch his sidekick Elisha. But Elisha won't let him out of his sight. So Elijah parts the Jordan river, they walk across, and Elijah is taken up into heaven. Elisha stands there crying "my father! my father! ", ripping his clothes. Even though he has apparently seen a great miracle, he seems to be deeply depressed. But now he has to take on the role of his mentor, doing the things his mentor did. So Elisha walks to the Jordan, yells an insult at God, and parts the water. He's exercising the power of his mentor, but with none of the grace or calm that his mentor used. The townspeople immediately begin asking for miracles. So he purifies their water, and then leaves. On the way out of town, some boys come out and start making fun of him. He yells a curse at them. Immediately, two bears come out of the woods and start attacking these boys. The end. It's a terrible story. But to me, it looks like a story about Elisha's sadness. Elisha is so grief-stricken about losing his mentor that he comes close to cursing God. He does his miracles reluctantly, with bitterness. And so when he curses those boys, it almost seems flippant, like he's not thinking it through at all. I almost get the impression he didn't realize anything would happen. On the surface level, this passage exists to show us that Elisha now possessed *power*. But just a little deeper, it seems to be pointing out that Elisha is now exercising a power he's not emotionally ready to handle. In fact, the rest of his recorded life seems fairly sad. On his death-bed (Elisha doesn't make it to heaven), they wail over him the same words that Elisha had wailed to Elijah. It's a very poignant scene. I thought that this was insightful about Elijah's own struggles: [http://girardianlectionary.net/res/alison_elijah.htm](http://girardianlectionary.net/res/alison_elijah.htm) So, I don't have any real answers here. But this is how the text appears to me on cursory examination, and if I were to search for the big-picture, I suspect that it would start to look more and more like a man cursed with a power he never truly knew how to handle. It's probably easy to misunderstand me as saying that the Israelites themselves were less violent than the world around them. But that is not the case. When oppressed people get power, they are often even *more* violent than the ones who oppressed them. The "average Israelite" of thousands of years ago would have been thrilled by the slaughter of people from rival nations. This is why they loved King David so much. But this is also why the accounts are so remarkable. They tell these "crowd favorite" stories of war and conquest and so forth, but they include within them deep pointers to just how screwed-up such kingships are. They even state it explicitly at the beginning: God did not want them to have a king. Kings mean your children will die in war. Imagine being an Israelite gathered around to hear the stories of heroic war and adventure. But the stories always start out with that huge disclaimer. That's like starting out a football game by talking about how violent it is, how many players sustain permanent injuries, how the cheerleaders are being underpaid and exploited...now are you ready for some football?!!! What's amazing is that all those critiques remained within the text, and were never edited out. Interesting thoughts on Elisha, Micah. Any thoughts on the God-commanded genocides in general, and Jericho in particular? One of the more profound things in the text is that Abraham and Moses call us to critique even the violence that appears to come from God. God is not a passive force to be obeyed, but a relationship to engage and wrestle with, as illustrated in the identity-giving moment when Jacob wrestles all night with God. That struggle with God is supposed to characterize the entire Israelite people. In the Joshua story itself, I've always thought the most interesting thing was the appearance of the "commander of the Lord's army" right before Joshua begins his conquest. Joshua asks whose side the man is on, and the man responds "neither". That's pretty much it. This little scene doesn't do anything other than to point out that God is on his own side. Which should give us pause as we read on. The other major element in the book is Rahab, the prostitute who both humanizes the enemy, and cleverly disrupts the purity of the Jewish story. Like several other stories in the Hebrew bible, this serves to take those excluded by Jewish legal requirements and canonize them in the center of Jewish identity. The New Testament continues this, pointing out that Rahab (along with three other scandalous women!) is an ancestor of Jesus. This is excellent, Micah. I think part of the akedah story is the change of name for God. At first, God's name is Elohim (Hebrew word for gods). It is curious that the name of God changes to YHWH when God stops Abraham's sacrifice of Isaac. I think it's part of the removing of violence from God that we see happening in the Bible. YHWH is the particular God of Israel, who for Christians is shown ultimately in Jesus, who rejects violence and calls us to do the same. Sean, you fail to take several things into account. Remember that we are talking about tribes that are basically barbarians here, late Bronze age people initially and then early iron Age. The majority are neither educated nor sophisticated, just simple superstitious herdsmen and farmers. The Ten Commandments and other Biblical law was a huge step forward to the ethical standards previously in place. "An eye for an eye" sounds harsh to us but it replaced a system of overkill revenge, an "Your whole family for my eye" type of mentality. Progress takes a lot of time. Christ spelled out quite plainly what God expects of His followers : love your neighbor as yourself, love your enemies, feed the hungry, cloth the naked etc. Its been 2,000 years and most "Christians" still fail to obey as they should, so we shouldn't be surprised at how ancient Israel acted, should we ? Its all because of this little thing called "Free Will". We have to want to obey, God doesn't make us obey. Thanks Sean, I'm not trying to argue against the position you're suggesting here. What I'm suggesting is that we have this piece of incredible ancient literature, and if we are going to talk about it, we might want to consider what it is really telling us. So I'm not really saying *God inspired it as a lesson in what NOT to do* - I'm saying that ancient scribes found ways to cleverly document and expose the violence that surrounded them. And given how thoroughly this is done, it is clearly not accidental. You can see this by comparing [similar writings](http://micahredding.com/blog/2012/04/28/image-god) from the ancient world. The Babylonians wrote stories, and sometimes the Jews took those stories and rewrote them to show the victim's side of things. Cain and Abel is a good example of that phenomenon - reversing other ancient stories to show the victim's viewpoint. This is not an argument for inspiration. It's an argument for a sustained and subtle critique that's probably unique in world history. If we want to talk about inspiration, we need to talk about where that critique came from. I think you can make an argument that this is exactly how God would choose to inspire people, but that's a metaphysical argument, and thus lies outside the actual usage of the text itself. What we *know* is that these are brilliant documents, whose stories ultimately disrupted the entire structure of the ancient world. As far as "Why didn't God just tell us not to kill?" Well, the Christian answer is that he did. The ten commandments concisely sum up most moral ideas. Originally, those *were* the bible. But obviously having those didn't do much for the ancient Jews: the kings still saw fit to kill as many people as they wanted. I see no indication that a more thorough moral code would have made the ancient world more just. Further, it wouldn't have addressed new moral issues that would arise. The solution humanity needed was not a moral code, but to see violence and compassion more clearly. The Hebrew scriptures do this, showing us violence and compassion. But because that vision is still not clear, Jesus determines to [complete the picture](http://micahredding.com/blog/2012/04/02/jesus-insurgent) himself. The first Christians saw this and were completely transformed. Since then, Christians have largely lost the ability to look honestly at what Jesus was doing. This indicates something Jesus himself pointed out - no one can force you to see the truth. Nevertheless, Jesus' life and the biblical stories have had a profound (and often unconscious) effect on the world. All of this to say that: 1. my argument is not really about inspiration at all 2. if the authors were inspired, this *is* what we might expect to see 3. most importantly, contemplating these accounts can help us see violence more clearly, regardless of our metaphysical or religious position. Sorry this is so long-winded! :) I really appreciate your thoughts. "There is no excusing that violence. There is no minimizing the horror of that violence." YES! And from this we grow by the process of loving enough to understand, then forgiving, then growing in wisdom.